Great buy. So glad I got this for my family room. No odor. No shedding. Great buy. Safavieh Handmade Antiquity Teal Blue/ Taupe Wool Rug - 7'6" x 9'6"
Love everything about these Safavieh wool rugs!! 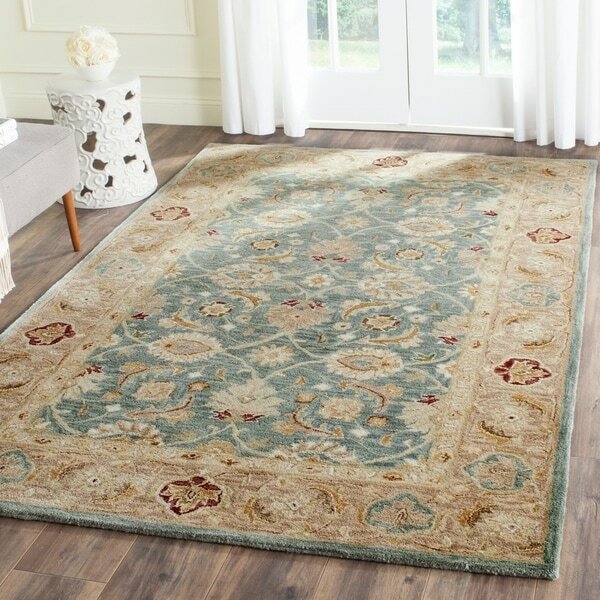 These Safavieh "Antiquity Blue Teal/Taupe Wool rugs are stunningly beautiful! After a period of trial (and errors, finding the right color), I ordered THIS one; and it's absolutely perfect for my home! I then ordered additional room-sized rugs for a consistent look in my new, little open-concept home. The colors in these rugs are gorgeous, the quality is exceptional; it's a thick, dense wool carpet, that has shown NO shedding/pilling issues I've read about. NO ODOR, and after rolling it out face-down for a few days, the edges lay nicely after allowing it to breathe and flipping it back to the top side. 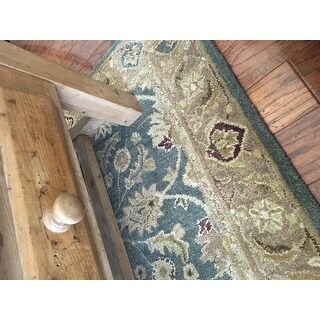 I HIGHLY recommend this rug - if it the color and design meet your needs. It is PERFECT for mine. Just waiting for the 12' runner to come back in stock so I can order a second one. This rug is so lovely. A heavy wool. My rug measures 48" x 71" exactly. The jade green color is exactly what I wanted, and the beige is dark enough that it won't easily show dirt. I am using this at my front door foyer, so it gets a lot of wear. Yes, it sheds a bit, but a weekly vacuuming with my Hoover keeps it all under control. A rug I expect will wear well and last for years! quality and color were very nice - pretty rug - but not 6' long as described. 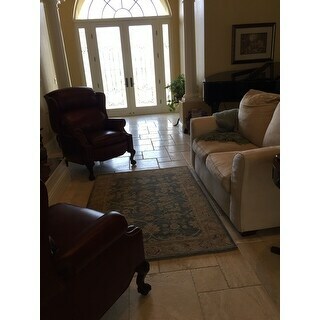 Rug as shown in picture. The colors are beautiful and the rug looks great with my grey walls. I have several Safavieh wool rugs and have never been disappointed. Will purchase again. Unlike some other rugs I've purchased online, this one came looking exactly as pictured online. The pile is thick and soft, colors are spot on, and the wool makes the carpet perfectly matte (unlike some of the synthetic rugs which are shiny.) The rug sheds a bit, but in my experience this is normal for wool rugs and is short-lived. Sold as turquoise but really green. Design looked cheap. Quality ok but otherwise disappointing. Another beautiful Safavieh rug from the Antiquity line. This is my second purchase from this line and I'm just as pleased with this one as the original. The colors are as pictured and the rug is soft and plush. I've had it for several days, but I'm still waiting for one end to uncurl. Keep in mind that the thickness of the rug might impede door movement absent sufficient clearance. Very nice and a great buy! I love Safavieh area carpets. This wool area carpet is awesome and the color is outstanding. It is soft and feels wonderful to walk on. This is my third Safavieh area carpet purchase because I love this brand so much!!!! This carpet does not shed even though it is wool. When I read one review that indicated this carpet shed, I was hesitant to go with wool. But I am so happy that I did choose this wool carpet. The pattern is beautiful and when I am in the market for another area carpet you can be it will be Safavieh!!! Excellent quality. Colors are true to the photos. Lovelier than expected. Looks very expensive and adds a bit of color to my neutral bedroom. The teal color looks more steel blue to me, in my room at least. Beautiful rug. Fast shipping on this rug. 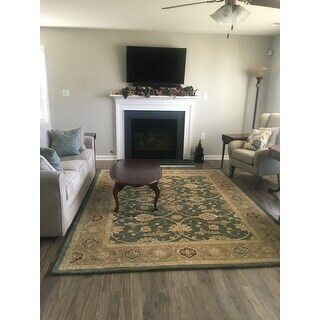 Ordered same rug in a different size and it still hasn’t arrived. This rug is a great rug. Nice and thick. Soft to walk on. A little more green than blue, but still works. Great quality at a great price. It's a nice quality rug but the color is more dark grey than teal. Keeping it but will probably pass along to a daughter. The color is the only reason I rated it so low. This rug is a nice complement to my entryway. It's nice and thick and helps define the foyer area. I would recommend it to a friend. Great thick rug that looks beautiful in my home. 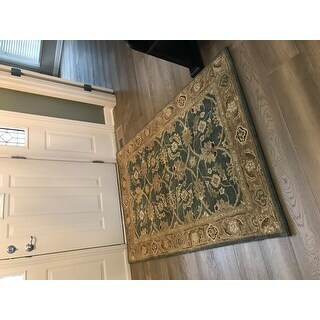 Beautiful color Beautiful rug-quality exceptional and it is teal but soft and goes so well in my foyer-would buy again-thank you Overstock for a quality rug that does not disappoint ! Colors are just like what is on the website ! This is about my 4th Safavieh carpet and is another winner. It arrived in a very short time and was true to the description. The Teal is a little more blue than green, which is just what i wanted. I bought both the runner and 4' x6' carpets which are both very well made. I have persian rugs in my home in this color scheme. It is a pretty rug. color and size was perfect.